Objective: To investigate the expression of lncRNA Novlnc6 in patients with different diseases and to explore the correlation between expression level of lncRNA Novlnc6 and Coronary Artery Disease (CAD). Methods: Plasma samples were prepared using the blood extracted from 28 CAD patients and plasma samples of 28 healthy people as well as patients with a variety of different diseases. In addition, the heart tissues were collected from both the lesion area and surrounding healthy area of 7 patients with CAD. The expression levels of lncRNA Novlnc6 in plasma and heart tissue were detected using quantitative real time polymerase chain reaction (qRT-PCR). Results: The expression of lncRNA Novlnc6 were significantly decrease in the plasma of patients with CAD and dilated cardiomyopathy compared with the healthy control, while the decrease in CAD patients were significantly higher than that in dilated cardiomyopathy patients. lncRNA Novlnc6 in plasma showed high storage stability and freeze-thaw stability. The expression of lncRNA Novlnc6 was down regulated in both plasma and heart lesion tissues. However, the decrease in plasma was significantly higher than that in heart lesion tissues. Conclusion: The down regulation of lncRNA Novlnc6 in plasma can be used as a biomarker for the diagnosis of CAD. lncRNA Novlnc6, Coronary artery disease (CAD), Plasma, qRT-PCR. Coronary Artery Disease (CAD), which is one of the most common types of heart disease, is a main cause of death all over the world . In China, it has been reported that deaths caused by CAD accounted for 41% of all the cases . In addition, CAD is also the main cause of failure in the treatment of a variety of diseases [3,4]. During the past two decades, due to the increased incidence rate of obesity and diabetes and the aging of the population, the incidence rate of CAD was also significantly increased . Conventional treatment methods including drug treatment has been widely used in the clinical treatment of CAD, however, those treatments were challenged by the adverse side effects or the drug tolerance developed during the long-term application of chemical compounds and the high recurrent rate . So it will be with great clinical values to develop early diagnosis method for patient with CAD to improve the treatment efficacy. In recent year, more and more studies have shown that noncoding RNAs have pivotal functions in the regulation of tissue homeostasis and various pathophysiological conditions . Long non-coding RNA (lncRNA) is a group of noncoding RNAs with a length longer than 200 nucleotides . It has been well accepted that lncRNAs have essential functions in the onset and development of various human diseases including liver diseases, cancer, heart disease and so on [8-10]. LncRNAs MALAT1 and Tie-1-AS, which are mainly expressed in endothelial cells, were proved to be able to regulate vessel growth and function . Previous studies have also shown that the specific lncRNAs that highly expressed in vascular smooth muscle were responsible for the contraction of smooth muscle cells . Novlnc6 as a member of lncRNAs, was mainly expressed in cardiomyocytes and have regulatory roles in the expression of bone morphogenetic protein 10 (BMP10), which is a key signaling ligand involved in cardiogenesis, and Novlnc6 was also found to have essential functions in the progression of acute myocardial infarction, indicating the important roles of lncRNA Novlnc6 in cardiac development and disease [11,13]. Therefore, it will be reasonable to speculate that lncRNA Novlnc6 may be involved in the progression of CAD. In our study, the expression pattern of lncRNA Novlnc6 in plasma of the patients with CAD and a variety of other diseases were detected by qRT-PCR. In addition, the expression levels of lncRNA Novlnc6 in heart tissues of CAD patients were also detected. The possibility of lncRNA Novlnc6 to serve as a biomarker for the diagnosis of CAD was also discussed. In this study, plasma samples were obtained from 28 selected CAD patients and plasma samples of 28 healthy people were used as controls. Among the 28 patients with CAD, there were 12 males and 16 females, and the age ranged from 21 to 77 y old with an average age of 49 ± 5.4 y. Among 28 healthy people, there were 14 males and 14 females, and the age ranged from 26 to 72 y with an average age of 52 ± 5.1 y. Heart tissue was collected from the lesion area and surrounding healthy area of 7 patients with CAD. Heart tissue samples were also collected from the patients with type 2 diabetes mellitus (10 cases, 4 males and 6 female, age ranged from 33 to 79 y with and average age of 54 ± 7.8 y), dilated myocarditis (10 cases, 5 males and 5 female, age ranged from 26 to 71 y with and average age of 56 ± 6.2 y), hyperlipidemia (10 cases, 6 males and 4 female, age ranged from 20 to 74 y with and average age of 58 ± 9.4 y), hypertension (8 cases, 3 males and 5 female, age ranged from 22 to 71 y with and average age of 49 ± 7.8 y), peripheral arterial disease (9 cases, 4 males and 5 female, age ranged from 31 to 68 y with an average age of 51 ± 4.8 y), pulmonary heart disease (11 cases, 6 males and 5 female, age ranged from 24 to 73 y with an average age of 59 ± 9.1 y), valvular disease (9 cases, 4 males and 5 female, age ranged from 25 to 71 y with an average age of 54 ± 7.2 y) and viral myocarditis (11 cases, 6 males and 5 female, age ranged from 28 to 78 y with an average age of 62 ± 7.8 y). No significantly differences in age, gender, history of smoking and history of drinking and other basic information were found between patients with different disease. This study was approved by the Ethics Committee of Shihezi University, and informed consents were obtained from all the involved patients. The whole blood was collected from all the patients and was mixed with 10% sodium citrate immediately after extraction, followed by centrifugation (2000 rpm) at 4°C for 10 min to remove the blood cells and collect the plasma. A total of 100 ml plasma was obtained form each CAD patient. The plasma was aliquoted into Eppendorf tubes with 500 μl in each tube. All the plasma samples were stored at 4°C before use. The heart tissue was collected from each patients and healthy control. All the tissue samples were stored at -80°C before use. RNA was extracted from all the samples using miRVana miRNA isolation kit (Ambion, Austin, TX) and the RNA quality was detected by gel electrophoresis. The reverse transcription was performed using iSCript kit (Bio-Rad, Hercules and CA). Applied Biosystems SYBR Green (ThermoFisher SCIENTIFIC, USA) and 1 μL cDNA were used to prepare the PCR reaction. The PCR reaction was performed using iCycler iQTM Real-Time PCR Detection System Instruction (Bio-Rad, Hercules, CA). The primers used in this experiment were as follow: lncRNA Novlnc6-forward: CTCCCCCATCTGTTTGCTTA; lncRNA Novlnc6-reverse: CCAGCTTTGTGTTTTGCTGA. PCR conditions were 40 cycles of 95°C for 10 s, 55°C for 30 s and 72°C for 25 s. The relative RNA expression level was calculated by -Ct method. β-actin was used as the endogenous control (forward: CTACAATGAGCTGCGTGTGG; Reverse: AAGGAAGGCTGGAAGAGTGC). Each sample was independently tested for three times. The primers were all synthesized by Sangon (Shanghai, China). SPSS19.0 software used to analyze all the data. The comparisons between groups were performed by t-test. p<0.05 is statistically significant. The expression levels of Novlnc6 in the plasma of 28 CAD patients and 28 normal healthy people were detected by qRTPCR. As shown in Figure 1, the expression levels of Novlnc6 in the plasma of CAD patients were significantly reduced compared with the healthy controls (p<0.01). Our data suggested that the expression of lncRNA Novlnc6 was downregulated in the plasma of patients with CAD. Figure 1: The expression of lncRNA Novlnc6 in the plasma of CAD patients and normal healthy people. Significant lower expression levels of Novlnc6 were found in patients with CAD compared with normal healthy people. Notes: **Compared with control group, p<0.01. It’s well known that the expression of lncRNA Novlnc6 was downregulated in the patients with dilated cardiomyopathy. However, the expression patterns of lncRNA Novlnc6 in the patients with other types of cardiac-related diseases have not been studied. In our study, the patients with CAD and dilated cardiomyopathy as well as a variety of cardiac-related diseases were involved. As shown in Figure 2, the expression of lncRNA Novlnc6 was significantly downregulated in patient with CAD and dilated cardiomyopathy compared with the healthy control (p<0.05 or p<0.01), while no significant changes in the expression levels of lncRNA Novlnc6 in patients with related diseases were observed. In addition, the expression levels of lncRNA Novlnc6 in CAD patients were significantly lower than those in patients with dilated cardiomyopathy (p<0.05). Our data suggested that the downregulation of lncRNA Novlnc6 can be used as a specific diagnostic biomarker for CAD patients. Figure 2: The expression level of lncRNA Novlnc6 in patients with different types of diseases. Compared with normal healthy people, expression of lncRNA Novlnc6 was specifically significantly downregulated in patient with CAD and dilated cardiomyopathy. Notes: *Compared with the normal control group, p<0.05; **Compared with the normal control group, p<0.01; #Compared with dilated cardiomyopathy, p<0.05. To serve as biomarker for CAD, lncRNA Novlnc6 should be easily detected. Therefore, the sensitivity of lncRNA Novlnc6 detection and the freeze-thaw stability of lncRNA Novlnc6 were also investigated in our study. As can be seen in Figure 3, the RNA levels of lncRNA Novlnc6 in the plasma was decreased along with time. However, lncRNA Novlnc6 can be detected by qRT-PCR after 12 h at room temperature. In addition, the storage at 4°C can reduce the RNA degradation of lncRNA Novlnc6 compared with the storage at room temperature. After 8 cycles of freeze-thaw, lncRNA Novlnc6 can still be detected in plasma, indicating the high freeze-thaw stability of lncRNA Novlnc6. Our data suggest that lncRNA Novlnc6 as a biomarker of CAD has high stability for storage and high sensitivity for qRT-PCR detection. Figure 3: The storage stability and freeze-thaw stability of lncRNA Novlnc6 in plasma of patients with CAD. 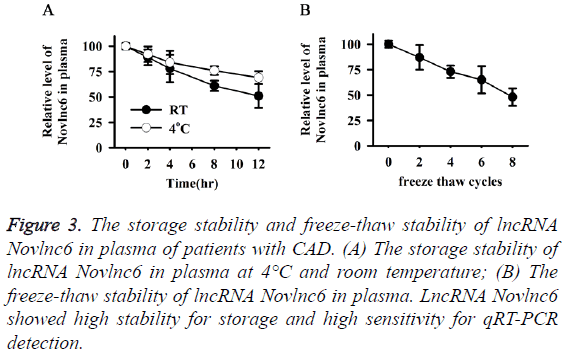 (A) The storage stability of lncRNA Novlnc6 in plasma at 4°C and room temperature; (B) The freeze-thaw stability of lncRNA Novlnc6 in plasma. LncRNA Novlnc6 showed high stability for storage and high sensitivity for qRT-PCR detection. The expression levels of lncRNA Novlnc6 in heart tissues of the patients with CAD were also detected. As can be seen in Figure 4A, expression levels of lncRNA Novlnc6 in lesion tissues was significantly down-regulated compared with normal tissue (p<0.01), while the expression levels of lncRNA Novlnc6 in plasma were significantly lower than those in heart lesion tissues (Figures 4A and 4B, p<0.01). 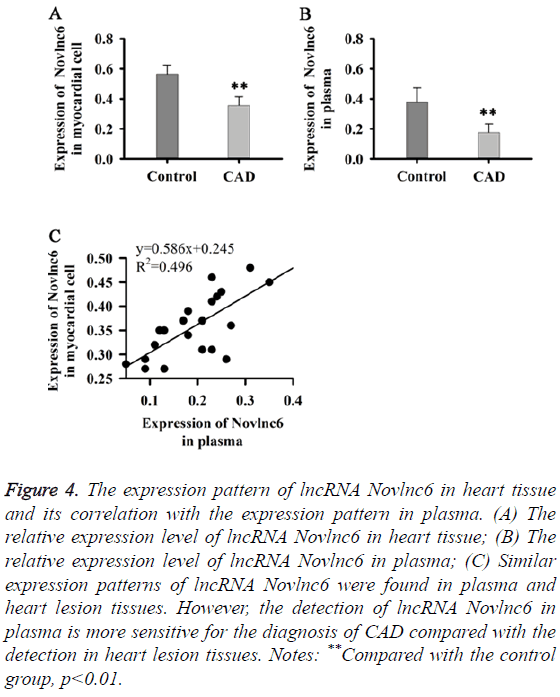 In addition, the expression of lncRNA Novlnc6 in plasma was positively correlated with that in heart lesion tissues (Figure 4C). Our data suggests that the expression of lncRNA Novlnc6 showed similar patterns in plasma and heart lesion tissues, however, the detection of lncRNA Novlnc6 in plasma is more sensitive for the diagnosis of CAD compared with the detection in heart lesion tissues. Figure 4: The expression pattern of lncRNA Novlnc6 in heart tissue and its correlation with the expression pattern in plasma. 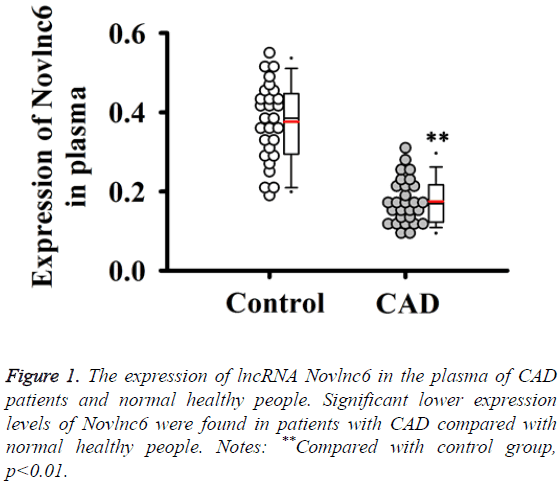 (A) The relative expression level of lncRNA Novlnc6 in heart tissue; (B) The relative expression level of lncRNA Novlnc6 in plasma; (C) Similar expression patterns of lncRNA Novlnc6 were found in plasma and heart lesion tissues. However, the detection of lncRNA Novlnc6 in plasma is more sensitive for the diagnosis of CAD compared with the detection in heart lesion tissues. Notes: **Compared with the control group, p<0.01. The treatment of CAD is challenged by the drug tolerance developed during the long-term application of chemicals and the high recurrent rate. Therefore, the early diagnosis and in time treatment is urgently needed to promote the treatment efficacy of CAD. Biomarkers are tools that are used to better identify individuals with high-risk of certain disease or physical condition . A recent study showed that the levels of oxidative stress induces secretion of Cyclophilin A (CyPA) in plasma of the CAD was increased with the increased severity of CAD and decreased after proper treatment, so the upregulated expression of CyPA can be used as an indicator of CAD . Another study showed that several miRNAs including miRNAs in miR-17/92a cluster, miR-106b/25 cluster, miR-21/590-5p family, miR-451 and miR-126* were differentially expressed in CAD patients and normal healthy patient, and the differential expression of those miRNAs can be used to distinguish the patients with high-risk of CAD from the ones with low risk . However, the application of those biomarkers is still limited by the individual differences in detection. Therefore, more biomarkers are still needed. It is well accepted that lncRNAs are involved in the progression of cardiac disease. With the development of Genome-Wide Association Study (GWAS), heart failure was found to be correlated with the expression of multiple lncRNAs. It has been reported that six Single-Nucleotide Polymorphisms (SNP), which were mapped to the lncRNA Myocardial Infarction-Associated Transcript (MIAT), were positive correlated with the incidence of myocardial infarction . LncRNAs were also reported to be involved in the cardiac event by regulating the expression of related genes. The normal cardiac functions depend largely on the correct activities of potassium channel . A recent study has shown that the transcription of potassium voltage-gated channel subfamily Q member 1 (Kcnq1), which is a potassium channel encoding gene, is regulated by the expression of lncRNA Kcnq1ot1 . The lncRNA antisense non-coding RNA in the INK4 locus or CDKN2B-AS1 (ANRIL), which is on the human chromosome 9p21, was the first lncRNA proved to be able to contribute to the susceptibility of CAD . ANRIL can recruit protein regulator of cytokinesis 1 (PRC1) and PRC2 to regulate the expression of genes in INK4b-ARF-INK4a cluster, which in turn regulate the progression of CAD and different types of cancer . LncRNA Novlnc6 was a newlyidentified heart-specific lncRNA that has potential functions in both the cardiac development and pathogenesis of cardiac diseases . Novlnc6 was reported to be able to regulate the expression of Nkx2.5, which is a key cardiac transcription factor, and the knockdown of Novlnc6 in cardiomyocytes can significantly inhibit cardiogenesis . In addition, the expression of Novlnc6 was always found to be downregulated in the patients with dilated cardiomyopathy . Consistent results were found in our study. The reduced expression levels of Novlnc6 were found in patients with dilated cardiomyopathy but not in patients with other diseases, such as diabetes mellitus, dilated myocarditis, hyperlipidaemia and so on. However, the expression of Novlnc6was also decreased in patients with CAD and the decrease was more significant than that in dilated cardiomyopathy patients, indicating that the downregulation of Novlnc6 expression is more specific for CAD. Specificity, sensitivity and stability are three important factors in the application of a specific biomarker . The high specificity will be helpful to avoid the cases with false positive signal. High sensitivity is required to reduce the cost of detection and high stability is import for the cases where timely detection is unavailable . As mentioned before, the downregulation of Novlnc6 expression is specific for the patients with CAD, indicating the high specificity of Novlnc6 to serve as a biomarker of CAD. The following experiments showed that Novlnc6 could be still detected by qRT-PCR after storage for 12 h at room temperature or 4°C. In addition, the RNA of Novlnc6 was still detectable after 8 cycles of freezethaw. All the data suggest Novlnc6 as a novel biomarker of CAD which has satisfied specificity, sensitivity and stability. In conclusion, the expression of lncRNA Novlnc6 was downregulated in the plasma of patients with CAD, and this downregulation of lncRNA Novlnc6 was found to be specific for CAD. LncRNA Novlnc6 in plasma also showed high storage stability and freeze-thaw stability. Therefore, lncRNA Novlnc6 can be used as a biomarker for the diagnosis of CAD. Deloukas P, Kanoni S, Willenborg C. Large-scale association analysis identifies new risk loci for coronary artery disease. Nature Genet 2013: 45: 25-33. Gao R, Yang Y, Han Y. Bioresorbable vascular scaffolds versus metallic stents in patients with coronary artery disease: ABSORB China trial. J Am College Cardiol 2015; 66: 2298-2309. Manoushagian S, Meshkov A. Evaluation of solid organ transplant candidates for coronary artery disease. Am J Transplant 2014; 14: 2228-2234. Lago RM, LaMattina TA. Chronic coronary artery disease [M]//MGH Cardiology Board Review. Springer, London 2014; 67-85. Mann DL, Zipes DP, Libby P. Braunwald’s heart disease: a textbook of cardiovascular medicine. Elsevier Health Sci 2014. Esteller M. Non-coding RNAs in human disease. Nat Rev Genet 2011; 12: 861-874. Perkel JM. Visiting “noncodarnia”. Bio Techniques 2013; 54: 301. Wang K, Liu F, Zhou LY. The long noncoding RNA CHRF regulates cardiac hypertrophy by targeting miR-489 novelty and significance. Circulation Res 2014; 114: 1377-1388. Takahashi K, Yan I, Haga H. Long noncoding RNA in liver diseases. Hepatol 2014; 60: 744-753. Prensner JR, Chinnaiyan AM. The emergence of lncRNAs in cancer biology. Cancer Discov 2011; 1: 391-407. Singh KK, Matkar PN, Pan Y. Endothelial long non-coding RNAs regulated by oxidized LDL. Mol Cell Biochem 2017; 1-11. Leung A, Trac C, Jin W. Novel long noncoding RNAs are regulated by angiotensin II in vascular smooth muscle cells novelty and significance. Circulation Res 2013; 113: 266-278. Philippen LE, Dirkx E, da Costa-Martins PA. Non-coding RNA in control of gene regulatory programs in cardiac development and disease. J Mol Cell Cardiol 2015; 89: 51-58. Vasan RS. Biomarkers of cardiovascular disease. Circulation 2006; 113: 2335-2362. Satoh K, Fukumoto Y, Sugimura K. Plasma cyclophilin A is a novel biomarker for coronary artery disease. Circulation J 2013; 77: 447-455. Ren J, Zhang J, Xu N. Signature of circulating microRNAs as potential biomarkers in vulnerable coronary artery disease. PloS One 2013; 8: e80738. Ishii N, Ozaki K, Sato H. Identification of a novel non-coding RNA, MIAT that confers risk of myocardial infarction. J Hum Genet 2006; 51: 1087-1099. Schmitt N, Grunnet M, Olesen SP. Cardiac potassium channel subtypes: new roles in repolarization and arrhythmia. Physiol Rev 2014; 94: 609-653. Korostowski L, Sedlak N, Engel N. The Kcnq1ot1 long non-coding RNA affects chromatin conformation and expression of Kcnq1, but does not regulate its imprinting in the developing heart. PLoS Genet 2012; 8: e1002956. Helgadottir A, Thorleifsson G, Manolescu A. A common variant on chromosome 9p21 affects the risk of myocardial infarction. Sci 2007; 316: 1491-1493. Yap KL, Li S, Muñoz-Cabello AM. Molecular interplay of the noncoding RNA ANRIL and methylated histone H3 lysine 27 by polycomb CBX7 in transcriptional silencing of INK4a. Mol Cell 2010; 38: 662-674. Ounzain S, Micheletti R, Beckmann T. Genome-wide profiling of the cardiac transcriptome after myocardial infarction identifies novel heart-specific long non-coding RNAs. Eur Heart J 2014; ehu180. Keshishian H, Addona T, Burgess M. Quantification of cardiovascular biomarkers in patient plasma by targeted mass spectrometry and stable isotope dilution. Mol Cell Proteomics 2009; 8: 2339-2349.